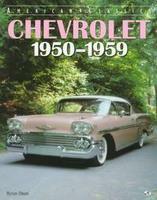 Chevrolet car books cover the history of the Chevrolet auomobile company and all Chevrolet models. Chevrolet is a brand produced by General Motors Company. Louis Chevrolet, a race car driver was the co-founder with William C. Durant, of the Chevrolet Motor Car Company in 1911, which was acquired by General Motors in 1917. Chevrolet High Performance by Robert Ackerson (1994). From their exhilarating beginnings, the Chevrolet performance cars are expertly examined and explained by Robert Ackerson. Includes Corvettes, Chevelles, Camaros, and more. Highlights the star performer in NASCAR and NHRA drag races. 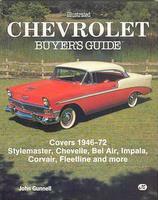 Chevrolet '57 Restorer's Technical Guide by Nelson Aregood (1990). This book does not show the casual rebuilder any basics of rebuilding. It is designed for the builder who wants his car to be completly original. The Louis Chevrolet Adventure by Pierre Barras (2004) concentrates on the man, the race driver and almost incidently a car manufacturer. This then, keeps the story within his life span (1878-1941). Early Chevrolet History: Passenger Cars 1912 To 1928, Trucks 1918 To 1945 Plus Other Makes Closely Associated with Chevrolet by Douglas Bell (1978) includes technical details, specifications, prices and rare historical material. Cast Iron Wonder: Chevrolet's Fabulous Six 1929-1953 by Douglas Bell (1961). Complete details and specifications for 1929-1953 Chevrolets. 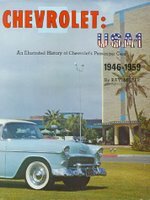 Chevrolet Chronicle: A Pictorial History From 1904 by Arch Brown et al (1991) contains lots of historical facts from the beginning of Chevrolet to the current day. Information for each year includes such things as engine type, transmission, rear-end, factory colour schemes and production rates. The book is loaded with pictures, including original promotional materials. Illustrated Buyers Guide: Chevrolet Pickup Trucks by Tom Brownell (1998) covers every Chevy light-duty truck built through model year 1998. Includes hundreds of photos, options, components and design changes, common repair and restoration needs and a five-star rating system. 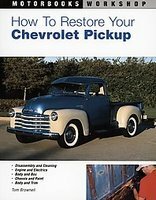 How To Restore Your Chevrolet Pickup by Tom Brownell (2004) is a step-by-step restoration guide for all Chevy light-duty trucks from 1928 onwards. 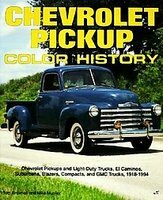 Chevrolet Pickup Color History by Tom Brownell (1994). A superb colour history on Chevrolet's pickup trucks from 1918-1994, including El Caminos, Suburbans, Blazers, Compacts and GMC trucks. Chevrolet Spotter's Guide 1920-1992 by Tad Burness (1993) includes Chevrolet Bel Air, Camaro, Chevelle, Chevy II/Nova, Corvette, Pickup Trucks, Vans, Corvair and El Camino. 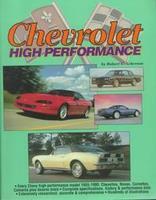 Chevrolet V8 Performance Guide 1955 to 1971 by William Carroll (2006). Specifications and tuning data for over 100 Chevrolet V8s (1955 to 1969), 98 carburetors, 16 fuel-injection systems, 22 camshafts, 16 cylinder heads and 20 stock ignitions. Part numbers, code letters and colour markings for the performance improvement swaps to be made. Catalog Of Chevy V8 Engine Casting Numbers 1955-1993 by Cars & Parts Magazine (1994) is anything a car owner needs to know about Chevy V-8 engines (1955-1993). Covers blocks, heads, crankshafts, intake and exhaust manifolds, carburetors, fuel pumps, water pumps, generators/alternators and EGR valves. Standard Catalog Of Chevrolet 1912-1990 by Pat Chappell (1990) is filled with profuse photos of about every model ever produced. 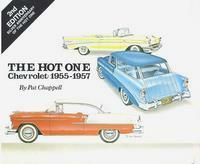 The Hot One - Chevrolet 1955 - 1957 by Pat Chappell (1977). A history of Chevrolet and the popular models of the mid-fifties. Chevrolet 1955 - 1957 by R M Clarke (1988). The 1955 model Chevy had the first V8 option since 1918. The 265 V8 was the forerunner of the 283-307-327-350-400 engines that followed. The body was squared off with a wraparound windshield. By 1957 fins were introduced in keeping with the era and a major introduction was the Turboglide automatic transmission. Most of the engine options were in the high performance category. In this period Chevrolet established a reputation for equipment that easily adapted to racing. This book consists of road tests, technical and specification data, model intros, consumer analysis, history, engines and transmissions and chassis reworking. Models covered include: Bel Air, station wagon, convertible, Beauville, 210 150, V8 coupe, Ramjet. 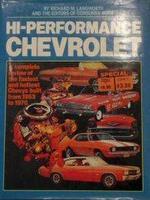 Chevrolet High-Performance Tips And Techniques by R M Clarke (1991) includes small and big-block buildups, superchargers, turbos, chassis information, transmissions and suspension. Chevy 348-409 Hi-Po by R M Clarke (1992). Covering modifying for horsepower, quarter mile techniques, racing Impala & SS performance, engineering the 348-409, specifications & history. Great tips and techniques help you get the most from your Chevy for street or strip. Chevy 302 And 327 Musclecar & Hi-po Engines by R M Clarke (1992). 'Hot Rod' reports on the Chevrolet 302 and 327 small block muscle engines. Covering blueprinting the Z-28 engine, 572hp unblown 327, 467hp 327, 501hp from 302, best heads for the 327 & 302, supercharging the 327. 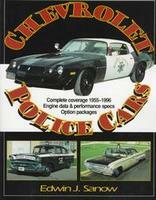 Chevy 265 & 283 Musclecar & Hi Po by R M Clarke (1992). Hot Rod reports on Chevrolet's revolutionary small-block V-8s Covers bolt-on horsepower, engine rebuilding, specs., street mods, hotting up a 283, restoration '301' speed secrets. Chevy Monster Big Blocks by R M Clarke (2008). A comprehensive selection of the best and most informative stories on one, or one family of engines. 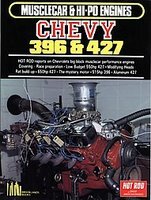 Chevy 396 And 427 Musclecar And Hi-Po Engines by R M Clarke (1991) covers race preparation, low budget 550hp 427, modifying heads, engine build-up, 650hp 427, the mystery motor, 515hp 396, 427. 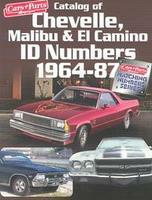 Chevrolet By The Numbers: The Essential Chevrolet Parts Reference 1970-1975 by Alan Colvin (1994). The only authoritative reference for identifying and verifying the correct Chevrolet parts, by casting number, for your exact model. 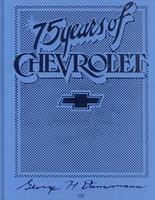 75 Years Of Chevrolet by George Dammann (1992) is a complete and accurate history of Chevrolet. 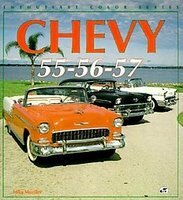 Sixty Years Of Chevrolet by George Dammann (1972). The creation of the Chevrolet was primarily the work of two men - Louis Joseph Chevrolet, for whom the car is named, and William Crapo Durant, who saw in the vehicle a wedge to regain control of General Motors. Chevrolet GMC & Buick Speed Manual by Bill Fisher (2004). A classic guide for any auto buff's library featuring California hot rods, track jobs, fast road cars, lakes cars and GMC engines in Chevrolet cars. The People's Choice: Ford & Chevrolet Battle To Mass-Produce A 'Classic' by John Freeman (1959). Reprints articles from old dealer catalogue, manuals, and advertisements. Original Chevrolet 1955, 1956, 1957 by Robert Genat (2003) focuses on all the details restorers and enthusiasts want to know. An entire chapter is devoted to the elegant '55, '56, and '57 Nomads and the unique components used on these stylish station wagons. A large appendix includes production numbers, component identification codes, and interior trim charts. Everything pertaining to Chevrolet's passenger car models from 1955-1957 is highlighted. 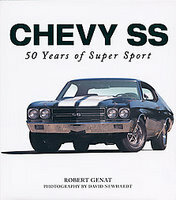 Chevy SS: 50 Years Of Super Sport by Robert Genat (2007) provides a close-up, detailed, full-colour look at such beloved muscle cars as the Chevelle, the Camaro, the El Camino, the Malibu, and the Monte Carlo. The book is a fittingly elegant celebration of the cars that redefined 'high performance' and defined an era. Illustrated Chevrolet Buyer's Guide: Covers 1946-72 Stylemaster, Chevelle, Bel Air, Impala, Corvair, Fleetline And More by John Gunnell (1989) details the collector Chevys from 1946-72 with model by model development history, hundreds of photos, specifications, production runs, investment ratings and owner advice. 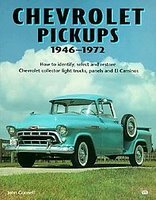 Chevrolet Pickups 1946-1972: How To Identify, Select And Restore Chevrolet Collector Light Trucks by John Gunnell (1989). 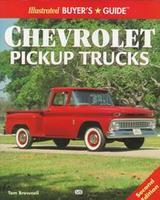 The first and most complete book to cover Chevrolet pickups. Packed with over 200 photos and detailed information on design, history, important differences, unique features, what to look for when buying one, and how to restore it. Chevrolet Stock Car Chronicle by Phil Hall (2002) includes five decades of stock car action. The book treats you to the excitement of fender to fender racing with more than 300 photos, many previously unpublished images from the archives of both the automaker and NASCAR. Special Introduction by three-time Winston Cup champion Darrell Waltrip. The Official Chevrolet Indy Pace Car Book From 1948-1990 by John Hooper & D Crispino (1992) is good reference material on Chevrolet Indy 500 Pace Cars. How To Hop Up Chevrolet & GMC Engines by Roger Huntington (2002) explains the V-8 family tree, planning the job, block mods and assembly, cylinder heads, intake manifolds, and carbs, ignitions, superchargers, estimating horsepower, and how to get the most performance for your money. The Chevrolet Racing Engine by Bill Jenkins (1976). From the introduction: The information herein is the result of more than twenty years racing experience with the small-block Chevrolet V8 engine and it is intended as a basic study of racing engine design and assembly. The illustrations show typical techniques and hardware. 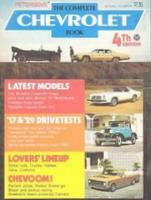 Chevrolet: A History From 1911 by Beverley Kimes (1984). A beautifully illustrated history of Chevrolet from 1911 to 1980. Remarkable for its high quality text, photography and production, this book is a must for all Chevy buffs. 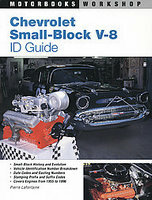 Chevrolet Small-Block V-8 ID Guide: Covers All Chevy Small Block Engines Since 1955 by Pierre Lafontaine (1996). Your complete guide to deciphering Chevy's small-block V-8 engine casting and stamping codes for all engines, from 1955 to the present. Determine the exact engine model, the year it was built, and its application. This valuable ID guide contains a complete list of dimensions More...and clearances for each model to aid builders in blueprinting and rebuilding. Chevrolet 1955: Creating The Original by Michael Lamm (1991) examines the 1955 Chevrolet's early engineering and styling development through exclusive photographs and interviews. The 1955 model represents Chevy's first truly modern car. Chevrolet 1911 - 1985 by Richard Langworth (1984). With Jan Norbye. It contains everything you ever wanted to know about Chevys past and present - from the Royal Mail and Baby Grand models of the 1920s to the modern Camaro and Corvette. Hi-Performance Chevrolet by Richard Langworth (1981) is a complete review of the fastest and hottest Chevys built from 1953 to 1970. 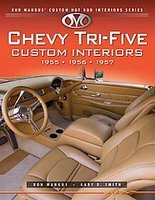 Chevy Tri-Five Custom Interiors: 1955, 1956, 1957 by Ron Mangus (2008). Detailed photographs of the interior features accompanied by Ron's captions explain the ideas behind the interiors' the design process, colour and material selections, unique features, challenges, sound system solutions and some of the creative problem-solving needed to work out the design. Ron is continually asked by customers and hotrod enthusiasts for pictorials of his interiors to enjoy and inspire, and this series answers the desire for a presentation of his creativity and innovation. Chevrolet USA-1 1946-1959: An Illustrated History Of Passengers Cars by Ray Miller (1977) is intended to be an aid to those interested in identifying significant features and design characteristics of the cars. In addition to a study of the overall appearance, much attention has been given to providing a photographic study of the details. The wheelcovers, hood ornaments, door knobs, dashboard instruments, are all carefully documented. A comprehensive ready reference for those interested in the evolution of the Chevrolet passenger cars. 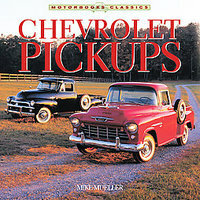 Chevrolet Pickups by Mike Mueller (2004). The legendary tale of how Chevrolet's line of trucks evolved from cars with beds to the sophisticated luxurious trucks of modern times. Includes the rise of the Depression-era trucks that made Chevrolet the number one manufacturer of light pickups, and Chevy's 30-year run in that top spot. Explains how the leaders and engineers at Chevrolet made the company's truck line such a dominant force and goes in-depth on many specific models that had enormous impact on the pickup truck industry. 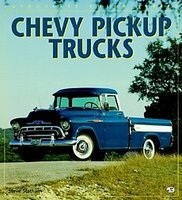 The complete history of Chevrolet trucks is covered, with sidetrips that shed light on the GMC counterparts, competitive brands, and the El Camino and Corvair pickups. Packed with photographs of beautifully restored pickup trucks. Chevrolet 1955-1957 by Mike Mueller (2004). The hottest Bel Air sedans, convertibles, Nomad station wagons, 150s, and 210s from around the country are featured in big colour profiles with historical text and captions that tell the story of America's classic tri-Chevys. 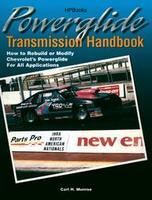 Powerglide Transmission Handbook: How To Rebuild Or Modify Chevrolet's Powerglide For All Applications by Carl Munroe (2001). Step-by-step instructions for how to modify the General Motors Powerglide Transmission for drag racing, road racing and circle track racing. Includes sections on theory of operation, transbrakes/valvebodies, adapters, disassembly, modifications, assembly, adjustments, installation, high horsepower applications and torque converters. Chevrolet 1950-1959 by Byron Olsen (1996) tells the fascinating story of Chevy's metamorphosis. Illustrated with more than 200 archival photographs and advertisements, this book explains how the Corvette was developed, the genesis of the 1955 models, the rising popularity of station wagons and pickups throughout the decade, and why the 1958 body design was a one-year wonder. Here is great information for 1950s Chevy fans everywhere. Chevrolet Six Car And Truck: Construction, Operation, Repair by Victor Page (1932). A practical treatise written in simple language, explaining the functions and construction of all parts of chevrolet six car and truck, with complete instructions for operations, maintenance and lubrication. Illustrated with specially made diagrams and authoritative photographs. Includes details of all 1932 improvements also up-to-date, thorough and easily understood instructions on Chevrolet servicing and repair, prepared by factory service experts and suggestions for tuning, inspection and trouble shooting. 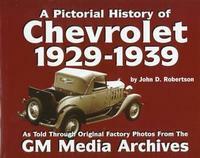 The Pictorial History Of Chevrolet: 1929-1939 by John Robertson (1998). This fascinating chronicle follows America's number-one carmaker throughout one of the most dramatic periods in the manufacturer's history. The result will prove an absolute delight for collectors, historians, or anyone with an interest in prewar automobiles. Some of the book's unique features include more than 250 photographs from the GM Media Archives, many of them never before published and long-presumed lost, depicting models from each given season. Never-before-published and detailed information on Chevrolets from each model year covered. A must for any Chevrolet enthusiast, as well as necessary reading for automotive historians. 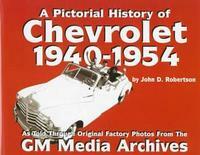 A Pictorial History Of Chevrolet: 1955-1957 by John Robertson (1993). An interesting and good pictorial history of the 1955-1957 Chevrolet golden years. 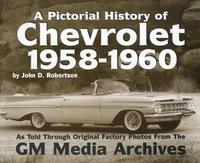 A Pictorial History of Chevrolet: 1958-1960 by John Robertson (2001). A look at the introduction of the Impala in 1958 and Corvair in 1960, plus the many styling changes of the period at Chevrolet. 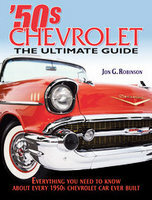 Standard Catalog Of 1950s Chevrolet by Jon Robinson (2006) leads readers through one of the most innovative eras of automobile engineering. Technical and production details with rich nostalgia, this book helps Chevy enthusiasts determine their favourite models. Whether collector, car buff or restorer this book is must-have. Chevrolet Police Cars by Edwin Sanow (1997). Photos and complete coverage of models and options in all Chevrolet-produced law enforcement vehicles from the '56 Small Block V-8 to the '96 Caprice. Engine data, performance specs, and equipment options are covered in-depth. Chevrolet The Performance Years 1961-1972 by Martin Schorr (1982) is a detailed look at the Chevrolet Camaro and Corvette with numerous black and white photographs. 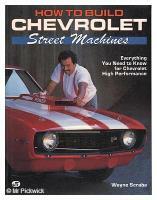 How To Build Chevrolet Street Machines: Everything You Need To Know For Chevrolet High Performance by Wayne Scraba (1990) gives you everything you need to know for building Chevrolet high performance. Chapters include high-performance engine building, carburettor power tuning, paint and bodywork for show and go, how to choose the best components, Chevrolet power parts interchange guide, street and strip suspension, wheels, tyres and bullet-proof rear ends. Chevrolet SS Muscle Car Red Book by Peter Sessler (1991). A complete and accurate statistical guide to the extremely popular Super Sport Chevys. 1967-72 Camaro SS; and 1965-73 Chevelle SS; and 1962-70 Impala SS. Colours, options, serial numbers, production totals, specs and facts. A vital fact book. Chevy Pickup Trucks by Steve Statham (1996). Beautifully restored original trucks, from the first Model T truck of 1918 through the mid-1990s. Colour photographs, brochures and older ads reveal a variety of popular light-duty, collectible Cameo, El Camino, Corvair 95 and Blazer models. 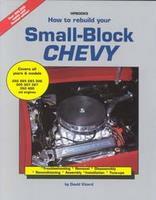 How To Rebuild Your Small-Block Chevy by David Vizard (1991). Hundreds of photos, charts and diagrams guide readers through the rebuilding process of their small-block Chevy engine. Each step, from disassembly and inspection through final assembly and tuning, is presented in an easy-to-read, user-friendly format. 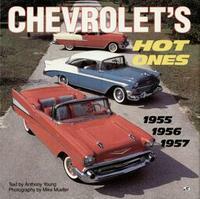 Chevrolet's Hot Ones 1955 1956 1957 by Anthony Young (1995). With Mike Mueller. Examines the legend behind the three most-beloved years in Chevrolet history. In one model year, Chevy wiped the slate clean and produced an automobile that managed to vanquish a staid and stodgy image. The 1955 model featured a new chassis powered by a brawny V8 and dressed out with a thoroughly modern body. America loved it. The Chevrolet Bel Air is a full-size automobile that was produced by the Chevrolet division of General Motors for the 1950-1975 model years. The Chevrolet Biscayne was a series of automobile produced by Chevrolet for model years 1958 through 1972. Brookwood was a name used by Chevrolet on certain models in its station wagons between 1958 and 1972. The Chevrolet Caprice and Caprice Classic were full-sized automobiles produced by General Motors from 1965 through to 1996. The Chevrolet Cavalier was a compact automobile produced from 1982 to 2005 by General Motors. The Chevrolet Celebrity was a mid-size car built by General Motors from 1982 to 1990. The Chevrolet Chevette was introduced in 1975 and produced for the 1976 through to 1987 model years. The Chevrolet Citation was a compact car sold by the Chevrolet from 1980 to 1985. The Chevrolet Impala was a full-size automobile built by the Chevrolet division of General Motors from 1958 to 1985, 1994 to 1996 and 2000 to present. The Chevrolet Kingswood was a station wagon produced by Chevrolet in 1959 and 1960 and again from 1969 to 1972. The Chevrolet Malibu is a mid-size car produced by General Motors from 1964 to 1983 and from 1997 to the present. The Chevrolet Monte Carlo was originally produced by Chevrolet from 1970 to 1988. The Chevrolet Monza was an automobile that was introduced in 1974 and produced until 1980. The Chevrolet Nomad was a station wagon model produced by the Chevrolet from 1955 to 1972. The Chevrolet Suburban is the longest-lived continuous automobile nameplate still in production, dating from 1935. The Chevrolet Townsman was a full-size station wagon produced by Chevrolet from 1953 to 1957 and again from 1969 to 1972. The Chevrolet Vega was an automobile produced by the Chevrolet division of General Motors for the 1971 to 1977 model years.